John Vetere is a Canadian-born chef and author (Cooks Book) who has been working in Southern Ontario’s best kitchens for the past 12 years. After completing culinary school at George Brown College, he earned an international post-graduate diploma from Alma – one of Italy’s most prestigious culinary schools. He received further training at Locanda Della Tamerici – a Michelin star restaurant in Luni Mare, Liguria, Italy. John has been an integral part of 4 notable restaurant openings in Toronto, which include: Scarpetta, The Chef’s House, A-OK Foods, and Yours Truly (awarded Best New Restaurant from Toronto Life Magazine, 2012). In 2014 John and his wife moved to Niagara-on-the- Lake in search of new business ventures. In 2015, John and his wife received a nomination for Niagara’s Young Entrepreneur of the Year award for the establishment and success of The Norton Underground – a secret society of ‘pop-up’ style dinners that were held in unique locations in and around Niagara-on-the-Lake. Furthermore, they received a notable mention in The New York Times for their work. The former Chef de Cuisine of Ravine Vineyard Estate Winery in St. Davids, Niagara-on-the-Lake for the past three years. John recently placed 2nd in the International PEI Shellfish Competition in 2017 as well as a bronze medal finalist at Gold Medal Plates 2016. 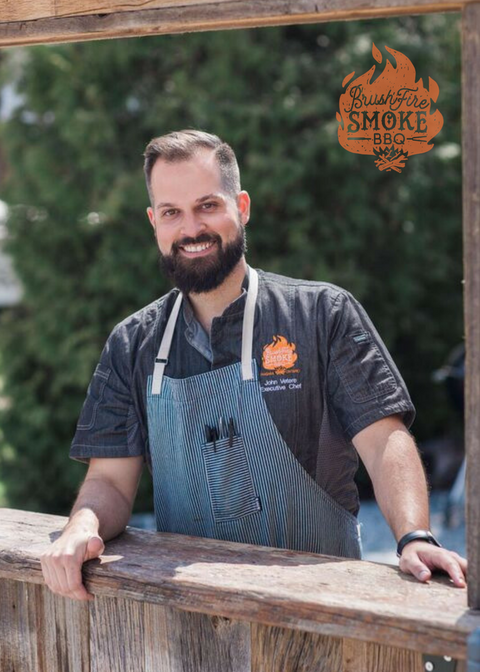 Currently, he is in the process of opening a brand new space in conjunction with Niagara Oast House Brewers called Brushfire Smoke where he is the Executive Chef. John’s style of food has many influences from his travels, with a focus on bright, vibrant and bold flavours, he combines his many European techniques with South East Asian flavours. In his newest venture with Brushfire Smoke BBQ, he is excited to apply his fine dining training, travels and experience to back-country cooking. Brushfire Smoke’s Grand Opening is set for Friday, May 18th, 2018. Come on down to the patio and be one of the first to try John’s amazing dishes!